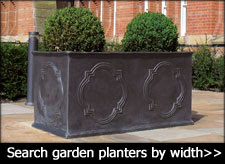 Faux Lead garden planters made from Fibreclay, Fibrestone and Fibreglass will enhance even the grandest of designs. The excellent Laura Ashley and English Heritage planters have been added to the range for 2018. Fibreclay Fibreclay is produced via an innovative process combining fibre recovered from the waste material of pulp mills with clay making this our most eco-friendly range of faux lead garden planters. Fibrestone Stone Powder has been mixed into the composite and skilfully moulded around a fibrous membrane to produce an authentic weathered faux lead range of garden planters. Fibreglass Fibreglass is a wonderfully tough and versatile material. All of the ingredients and colours are included in the original mix so that the colour goes all of the way through. Choose from an extensive range of classic and contemporary styles like the Hampton, Cromwell and Grosvenor. Our faux lead fibreglass planters can be seen sitting majestically outside the National Gallery, the Savoy, The Lowry (Manchester) and inside Blarney Castle, Tresco Gardens Scilly Isles and the Whitbread Brewery City of London. The Fibreglass range of pots and planters are so realistic even the keenest eye cannot distinguish from the original materials like lead, bronze, stone and terracotta. Fibreglass is a durable and versatile material, lightweight and totally frost-proof. The season’s collection boasts some of the finest contemporary and traditional pieces available on today’s market that are sure to enhance even the grandest of interior and exterior designs. Many gardens and buildings have successfully introduced the Fibreglass range of products into their landscape including Bluewater Shopping Mall, The Savoy, The National Gallery and Tresco Gardens Scilly Isles. Please note that all products in the Fibreglass range are made to order and the lead time is determined by the manufacturer’s order book. Lead time is listed as 3-6 weeks although in many cases orders are despatched within 10 working days. Self-watering planters by Lechuza are made from unusually robust PVC material and suitable for both indoor and outdoor use. Choose from six different styles. Cararo, Classico, Cubico, Delta, Quadro and Rondo. A sub-irrigation system is included in the price and will take care of your plants for you for up to 12 weeks, ensuring that they receive the right amount of water and nutrients required for optimum growth. Simply refill the reservoir when the water level indicator runs low. Lechuza is a stylish range of contemporary planters that will enhance any interior or exterior landscape. Suitable for conservatories, kitchens, living rooms, balconies, roof gardens and patios they are exceptionally high quality planters that are lightweight, durable, UV and frost resistant. There are six modern colours available for 2018. In high-gloss choose from scarlet red, white, black and taupe. In metallic choose from charcoal and silver. Lechuza planters are manufactured in Germany. Our estimated delivery time on all Lechuza self-watering planters is between 2-5 days. ADEZZ is a Dutch manufacturer of high-quality garden planters, water-features and wood burners and a brand that is revered within the landscaping community. Riverhill Garden Supplies are the leading retail supplier of ADEZZ products in the United Kingdom and your first call for anything ADEZZ. Choose from high-quality extra-large garden planters manufactured from Aluminium, Corten Steel, Fibreglass, Galvanized Steel, Hardwood and Polymer Concrete. Water Features including large ponds, water tables and water bowls and an extensive range of Wood Burners and BBQs. Prior to the firing process Old Ironstone Planters are sand blasted by hand to achieve a pitted, antiqued and authentic patina that is never replicated. Marry up Old Ironstone Planters and Old Ironstone Cylinders with eye-catching feature pieces such as the Old Ironstone Jar, Old Ironstone Lagro Planter, Old Ironstone Urn and Old Ironstone Ribbed Jar. Salt-glazed stone is high-fired at temperatures in excess of 1200 degrees centigrade to produce an extremely hard-wearing weathered range of Ironstone Planters revered for both their classic style and durability. Marry up Cambrills, Reus, Duato, Tiber and Toscana planters with over-sized and striking feature pieces such as the Vilanova, Jerez, Ceuta, LLaverneras, Tinaja and Irun urns. Padana Troughs can be added to enhance the design. 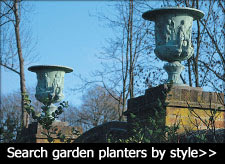 Classic Large Stone Planters are a durable and hard-wearing range of classic stone garden pots. The Old Stone Cylinder, Old Stone Jardineer and Old Stone Alpine Trough are all covered by a manufacturer’s 10 year guarantee and represent excellent value for money. View all traditional and contemporary garden pots and planters. The Fibreglass Geometric Window Box is the preferred choice of our professional landscaping community and will enhance any front of house when planted up correctly. Create a 'dark drama' using black grass, red and purple trailing verbena and Dahlia 'Bednall Beauty'. If you prefer bright splashes of colour plant up yellow gazanias, Alaska nasturtiums, Brachycombe 'lemon mist' and yellow snapdragons. Finishes and Lead Times - Textured Aluminium and Faux Lead finishes work extremely well and owing to their popularity we do hold stock in most sizes. The average lead time for both finishes is 2 weeks. Textured Old Penny Bronze is made to order with a lead time of 6 weeks and is sure to enhance any traditional landscape. RAL or BS (British Standard) colours - Customise your planter with a choice of over 300 stylish textured finishes. Click here to view all of the finishes available. Each colour will have it's own unique code that you will need to enter below. There is a lead time of 6 weeks on all BS and RAL bespoke finishes. If you require any advice please call customer services on 01732 522471 who will be happy to assist you. Riverhill Garden Supplies 2019 new Spring/Summer range of traditional and contemporary garden pots, planters, urns and troughs will enhance the grandest of designs. The collection has been chosen by our team of garden designers with your landscape in mind. Order online or call 01732 522471 to speak to a member of customer services. Delivery to the United Kingdom only. Lines are open between 8am to 10pm Mon-Sat including Bank Holidays except Christmas Day. 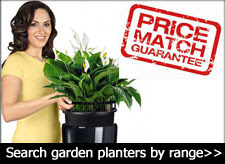 "Welcome to Riverhill Garden Supplies 19th year online! Thank you for your support. As you would expect we have all worked extremely hard this season to source the finest garden pots and planters for both the hobby gardener and professional landscape designer. 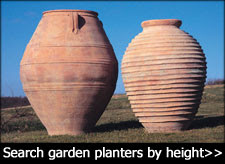 Please measure up before placing your order, some of our planters are huge! All the dimensions you see listed on the website are external measurements. If you have any questions or would prefer to order over the telephone our dedicated customer services team is on hand to help. Please telephone Sevenoaks 01732 522471 for assistance, Mon-Sat 0800hrs to 2100hrs including Bank Holidays. On the rare occasion that you see a like for like product being sold online for less please let us know and we will endeavour to price match. Now stocking ADEZZ Planters, Burners and Water Elements. Click here to view all ADEZZ products and here to download the ADEZZ 2019 catalogue. Copyright © 2019 Riverhill Garden Supplies. All rights reserved.